Heads of political parties will face criminal action in case a protest by their party turns violent. These are part of the new guidelines for Deputy Commissioners and SSPs in Punjab for giving permission for a function or protests and to take action in case something goes wrong. Chief Minister Capt Amarinder Singh had asked Home Secretary NS Kalsi to prepare detailed guidelines in the wake of the Amritsar train tragedy. A spokesperson said under the guidelines, permission for a function would also be required from Central departments if their space was to be used, adding that permission should be taken at least a week before the event or five days in case of urgency. The Punjab Assembling and Procession Guidelin-es/Advisories 2018, provide that the authority to which an application for permission has been submitted may obtain permission or comments from other departments. The authorities shall also ensure that the organisers and participants do not indulge in destruction of public and private property. 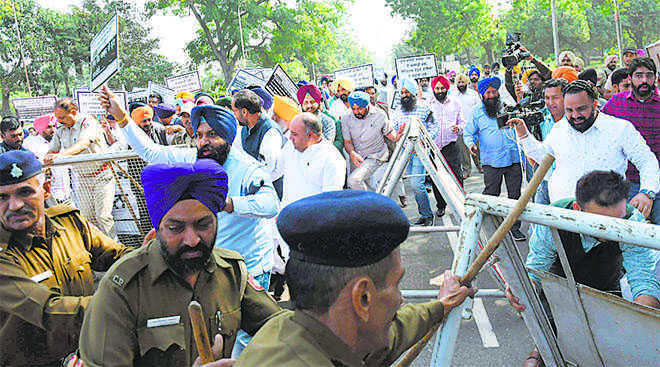 If any person or organisation, including a political party, calls for any violent protest aiming at destroying public or private property or calls for any protest that subsequently results in destruction of public or private property, an FIR shall be registered showing the names of the leaders or persons who had expressly called for such protests.